For those who prefer a more intimate experience onboard and on the islands, we recommend choosing a small yacht. The small yachts that we offer are typically handmade romantic sailboats or swift modern motor yachts that offer high quality personal service. With fewer people you are more likely to get to know your shipmates, develop a relationship with your guide, be able to ask him or her more detailed questions, and have less people to compete with when taking photos. Likewise, a small group generally has less impact on the fragile Galapagos environment. Another advantage to small yachts is the fact that often, large ships cannot anchor or disembark at some visitor sites due to their size or a high number of passengers. 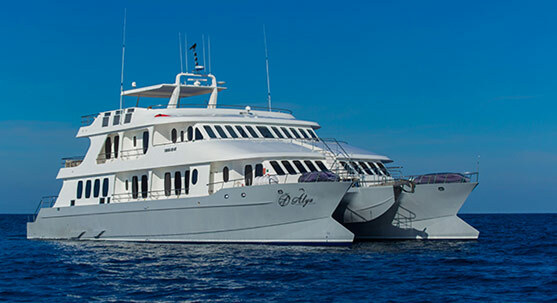 We have divided the small yachts we offer into high-end yachts, first class, mid-range and low priced Galapagos tours. For those that want the extra safety, social feel, amenities, stability, and spaciousness that cruise ships provide, larger ships may be the ideal way to visit the Galapagos. If you are looking for the "Love Boat" or similar gigantic cruise ship, you will have to look elsewhere. The Galapagos National Park sets a wise limit on ships to 100 passengers and on-land tours to 20 people per group. The cruise ships offer more spacious and often more comfortable standards in service and accommodations than you thought necessary, but will truly enhance your trip. For example, most have a buffet style breakfast and lunch, with dinner served in a more formal atmosphere. Often, there will be greater variety in choosing when to disembark for the islands and when to snorkel, along with an intercom system announcing the day's schedule in advance. The cabins are spacious and the size of the boat provides for less rocking for those that have a difficult time travelling on the sea. 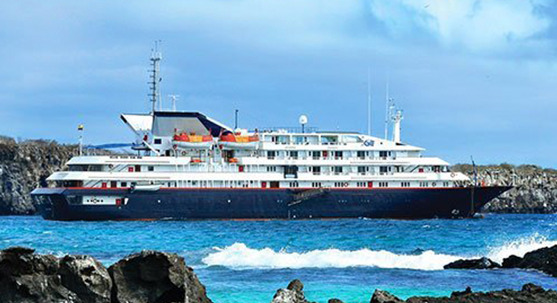 Click here for a review of our Galapagos cruise ships.